In response to this growing demand is a delicious, inspiring, and rapidly expanding supply of vegan foods, restaurants, educational opportunities, cooking courses, meal kit delivery programs, support groups, books, documentaries, travel tours, and everything in between! Without a doubt, veganism is steadily on the rise, growing daily with news of its vast advantages for human health, for the struggling and depleted planet, for the billions of animals that are needlessly tortured and slaughtered every year for food, as well as for many other remarkable reasons. In response to this growing demand is a delicious, inspiring, and rapidly expanding supply of vegan foods, restaurants, educational opportunities, cooking courses, meal kit delivery programs, support groups, books, documentaries, travel tours, and everything in between! As exciting as the momentum of this movement is, it is also noteworthy that learning an entirely new way of eating (and lifestyle) can be intimidating, overwhelming, and/or confusing for newbies. But, it doesn’t have to be. It is like learning a new language–challenging at first, but progressively easier and easier until it becomes natural, effortless, and fluent. 1. 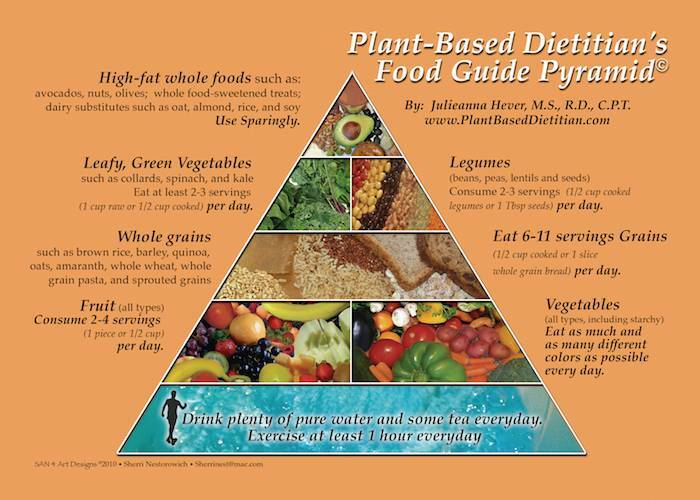 Follow the Plant-Based Food Pyramid or Plate to ensure a well-rounded diet based on vegetables (especially leafy green vegetables…note they have their own category), fruits, whole grains, legumes, nuts, seeds, herbs, and spices. 2. 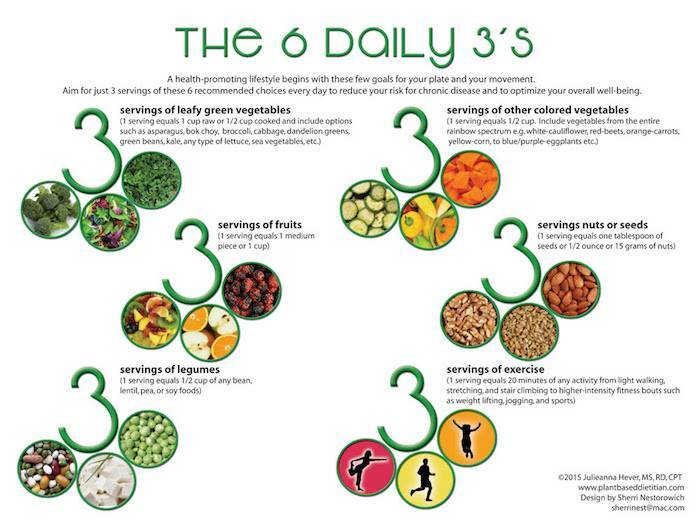 Keep it simple with The 6 Daily 3’s, a companion perspective to the pyramid and plate. 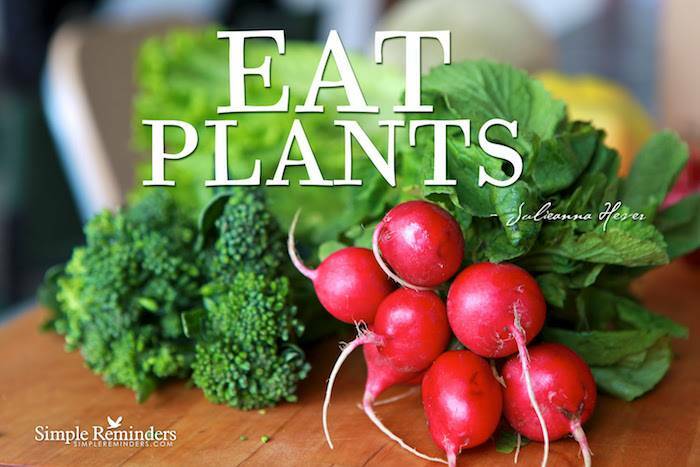 Prioritize three servings of each of the following everyday: leafy green vegetables (one serving equals one cup raw or half cup cooked), other-colored vegetables (one serving is one half cup), fruits (one serving is one medium piece or 1 cup), legumes (one serving is one half cup cooked lentils, beans, peas, or soyfoods), nuts and seeds (one serving is one tablespoon seeds or one half ounce or 15 grams nuts), and exercise (one serving is 20 minutes of any activity). 3. 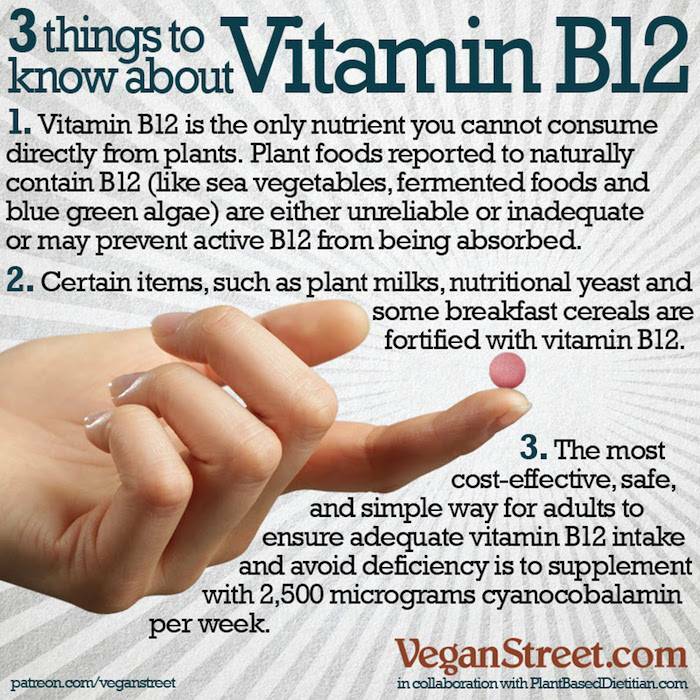 Mind your B12. The safest, most effective, and cheapest way of avoiding vitamin B12 deficiency is to simply take a supplement. According to Jack Norris’ guidelines, make sure to take in at least 2,000 micrograms of cyanocobalamin every week (for adults). 4. 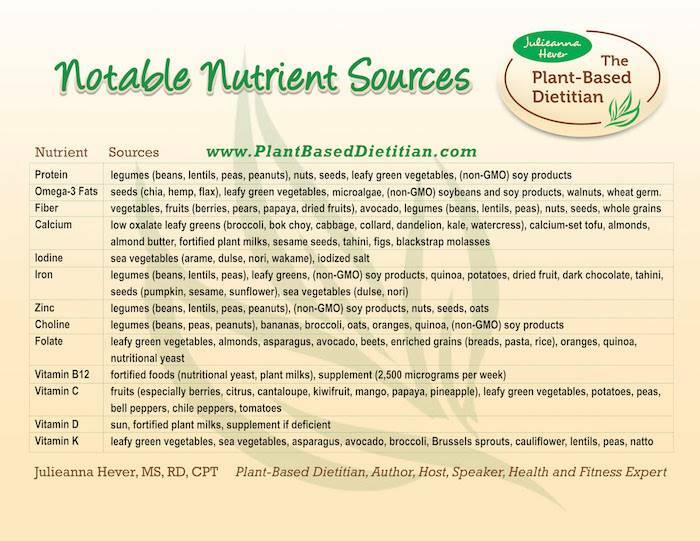 Note notable nutrients without being overly concerned with them. Instead of worrying about where you will get your [protein, omega-3’s, iron, vitamin D, etc.] from, be mindful about where these essential nutrients are found so you can be at ease and select your overall diet conscientiously. Use this chart as an easy reminder. 5. Have fun! Nutrition need not be so serious. 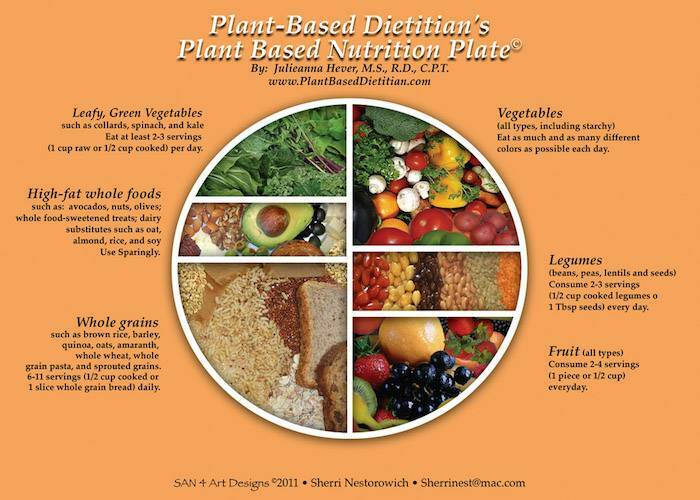 One of the greatest gifts of redefining your plate by transitioning to a vegan diet is that you are motivated to look beyond the typical meat-in-the-center-of-the-plate philosophy most of us were raised with. Experiment with new ingredients and new combinations, find what you absolutely love, and build your new repertoire of favorite recipes. Try playing with international recipes, tantalizing bowls, super fun salads, sensational soups/stews/chilis, comfort food, gluten-free vegan dishes, savory snacks, hummus, quick and easy main dishes, and even wholesome desserts. Overall, keep it simple and just….